What was that? A recipe? On this site? Don’t worry, this isn’t something I concocted on my own, I wouldn’t subject you to that. No, this is something much better. 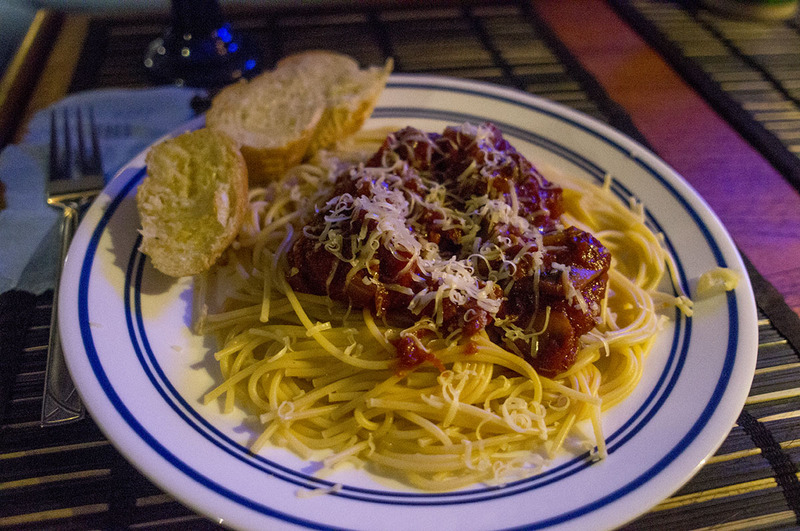 Luki’s recipe for his spaghetti and meatballs that he passed down to me and, even better for you, had no objection with me sharing it on our site. These are hands down some of the best meatballs I have ever tasted in my life anywhere, and I’m here to share the recipe with you today. I’ve made this recipe on my own now, unfortunately not having all of the ingredients that Luki had made them with each time we were served them on Skebenga, although they still came out pretty frickin good. 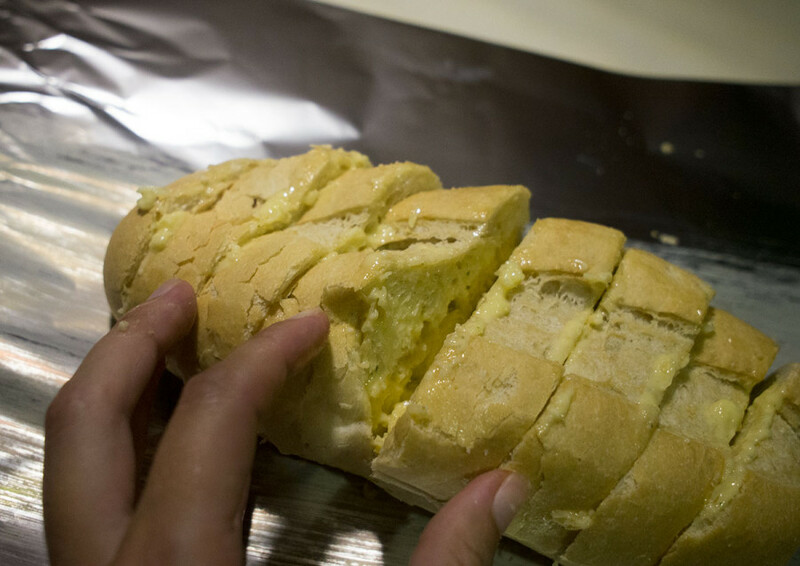 Below I’ll write the recipe as it was given to me, and then let you know how I prepared it myself. Also, there weren’t necessarily measurements of the spices included when I was told how to make it, so I’ve attached photos of what my mixing bowl looked like before combining everything. It may take a few attempts to figure out exactly how much of everything you want to include, a little more of this, a little less of that, but I promise, you still won’t be disappointed with your first few tries. Mix ingredients together and form into balls. Lightly oil a non stick pan, wait for the oil to heat, place meatballs inside pan. Let meatballs brown, turning half way through to fully cook. Approx 8-10 min. Well, I’m terrible at making grocery lists, and even worse about remembering to bring them to the grocery store with me, so I was not able to get the shallots/spring onions because I forgot that I was supposed to look for them. In place I used about a half a cup of chopped white onion. It did the trick, but I think the shallots would have been more flavorful if I’d used them. Since I did not measure out any of the spices, I’d venture a guess that I added about a ½ teaspoon of black pepper, a few pinches of table salt, and a few sprinkles of garlic salt. I probably could have gone just a little bit heavier on the salt and pepper. 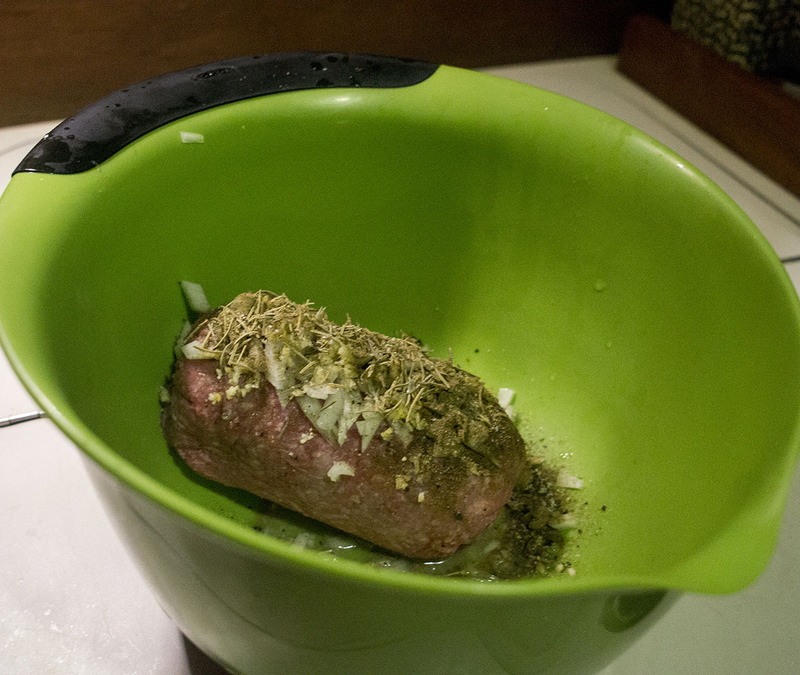 About a half teaspoon of thyme was added, although I probably could have gone up to ¾. I used dried Rosemary sprigs and used about 3 pinches of them (is that a term?). Mixing everything together, I was then able to separate the meat into 14 medium sized balls, although you could always change it to fewer balls if you want them larger. In lightly oiled non stick pan, add the onions and sautee. Then add the diced tomatoes along with the splash of dry white wine, and simmer 5-10 minutes. Place the meatballs in the sauce to soak and cover. 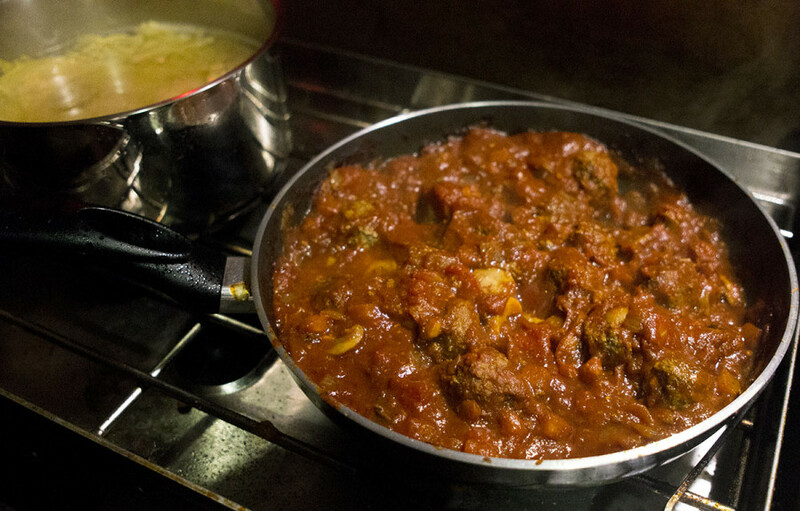 If the sauce is thin, add tomato paste to desired thickness. Add a spoonful of sugar and let simmer for another 20-25 minutes. Since I live in a small space and like to fill my sink with as few dishes as possible, I used one pan throughout this. I’m not claiming to be a master chef, so I don’t know if that changed the outcome, but it still tasted just fine to me. I added the onions right to the pan that the meatballs were cooking in and let them simmer for 2-3 minutes. I did not have any white wine on board, so I omitted that step. Since my can of diced tomatoes appeared to be making a very thin sauce I ended up added a 5 oz can of tomato paste and it worked out great. Also, I added a can of mushrooms since, well, they’ve been sitting in the bilge for 18 months and really needed to be used. My 400 g of ground beef topped with all the seasonings. 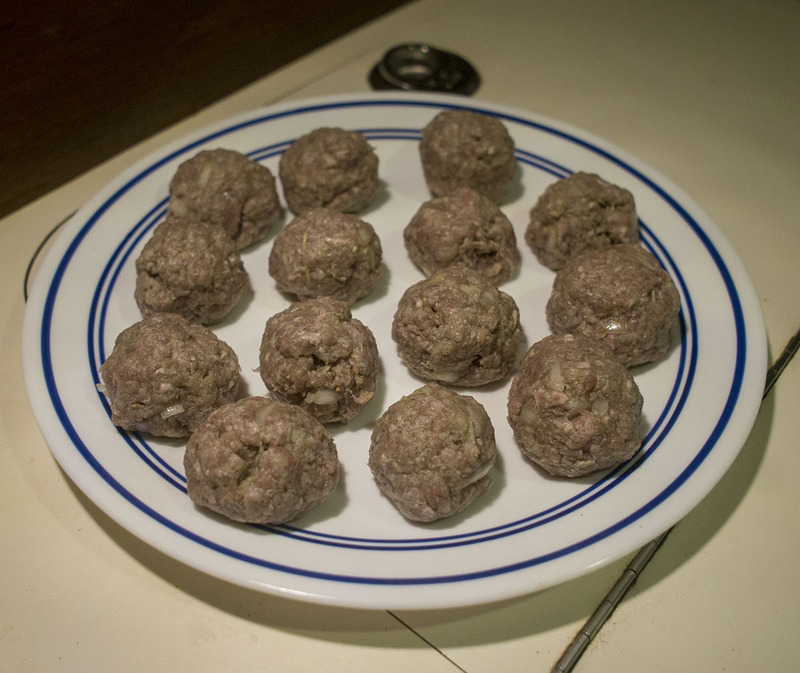 Formed into meatballs and ready to hit the skillet. Everything simmering together in the pan. 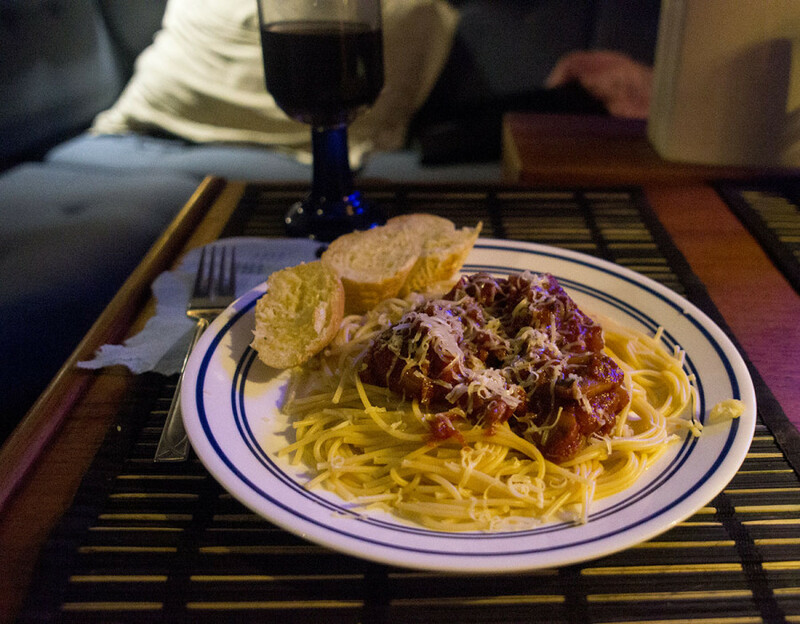 This entry was posted in Recipes and tagged cooking, spaghetti and meatballs. Bookmark the permalink. I’m actually going to try these meatballs. I’ll let you know how they turn out. If they are too much trouble, I’ll just go out and buy a box of that “all in one cornbread casserole” we all loved so much years ago! To make it a little better, take the pasta out of the boiling water 1-2 minutes before it is done. Drain the VAST majority of the water out, leaving only 2-3 tbsp in the pot. Add that to the sauce to allow the pasta to finish cooking. That way you really get the flavour of the sauce into the pasta. This also makes any leftovers much better. Just heat some oil in a pan and dump in all of the pasta and sauce together. The pasta won’t dry out, and you only need one pan to reheat. That sounds like a good tip, I’ll have to try that out!